This Handbook brings together major aspects of Japanese linguistics, presenting overviews, current concerns and future directions of each topic. The areas included are phonology, syntax, semantics, morphology, language acquisition, sentence processing, pragmatics, and sociolinguistics. This Handbook is for those who are familiar with the topic at the basic level and wish to investigate it in more detail, but it also can be used as a language-specific and typological reference. Written by leading scholars in the field. 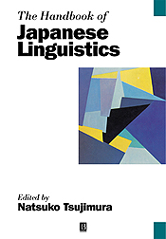 Provides a unique and authoritative survey of Japanese linguistics.